Tooth enamel, which is the hard, outer surface of a tooth that protects against decay, primarily consists of calcium and phosphate. Vitamin D plays a key role in the absorption of calcium and phosphate, therefore, inadequate vitamin D can cause a lack of enamel, which can lead to cavities. Studies have linked vitamin D deficiency, in both the mother during pregnancy and the child after birth, to an increased risk of cavities. Today, we highlight two recent studies showing an association between vitamin D and childhood cavities. A study was published this month (March 2019) in the Journal of Dental Research that assessed the association between maternal vitamin D levels during pregnancy and the rate of severe early childhood cavities in Alaska Native children. Cavity status was determined by a score based on the amount of decayed, missing, or filled primary teeth. 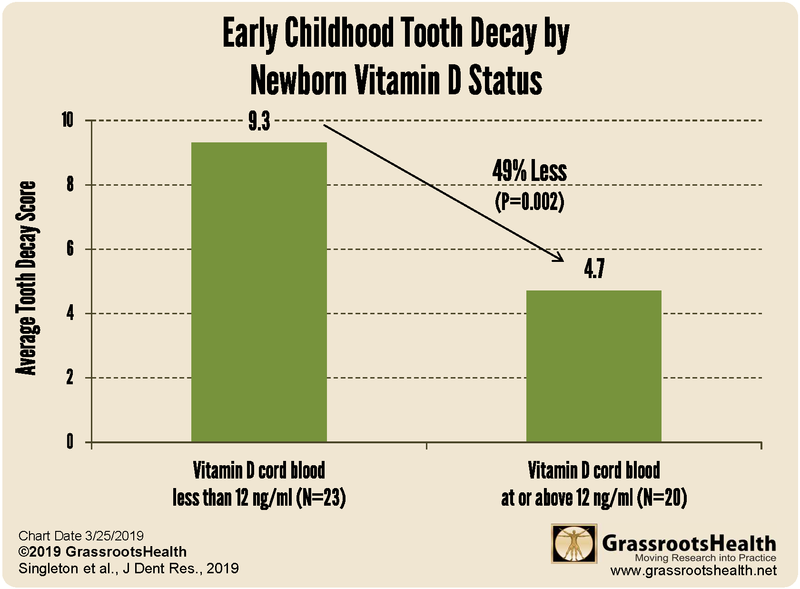 In 43 children between one and three years of age, the research team found that children with cord blood vitamin D levels at or above 12 ng/ml (30 nmol/L) had half as much tooth decay as children with cord blood vitamin D levels less than 12 ng/ml (P = 0.002). In September 2018, a study assessing the relationship between vitamin D levels in children and early childhood cavities was published in the Journal of Dentistry for Children. This study examined 276 children aged one to six years old who received care at Seattle Children’s Hospital between 1999 and 2014. The research team found that children with vitamin D levels at or above 30 ng/ml (75 nmol/L) were half as likely to have cavities as children with vitamin D levels less than 30 ng/ml (P<0.001). 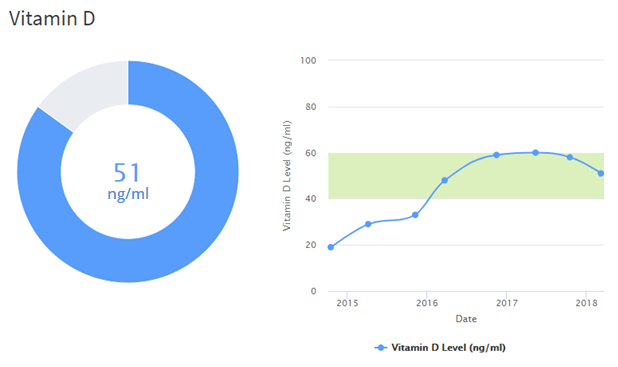 Test your vitamin D levels today! Use coupon code DForLife at checkout for 10% Off Any D*action Test Kit. To help you track your supplement use and nutrient levels, GrassrootsHealth has created an online tracking system called myData-myAnswers. For each specific supplement, you can track what days you take it, how much, and many other details. This will help you know your true supplemental intake and what patterns of use work for you to reach and maintain optimum nutrient levels. Check it out today!